Young adults received information regarding the platforms of two candidates for mayor of a troubled city. Half constructed a dialogue between advocates of the candidates, and the other half wrote an essay evaluating the candidates’ merits. Both groups then wrote a script for a TV spot favoring their preferred candidate. Results supported our hypothesis that the dialogic task would lead to deeper, more comprehensive processing of the two positions, and hence a richer representation of them. The TV scripts of the dialogue group included more references to city problems, candidates’ proposed actions, and links between them, as well as more criticisms of proposed actions and integrative judgments extending across multiple problems or proposed actions. Assessment of levels of epistemological understanding administered to the two groups after the writing tasks revealed that the dialogic group exhibited a lesser frequency of the absolutist position that knowledge consists of facts knowable with certainty. The potential of imagined interaction as a substitute for actual social exchange is considered. While I am intrigued, I do have some skepticism about the “epistemological understanding” outcome measure. This approach is based upon a Kuhnian model of science, an approach that is largely rejected by philosophers and historians of science. 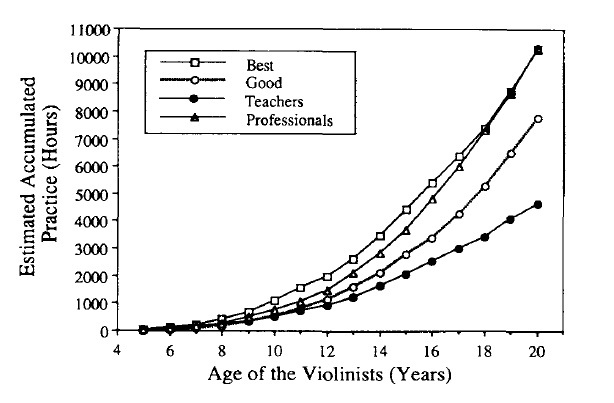 I am not sure this undermines the role of deliberate practice, but I think it puts the extreme claims made on its behalf into perspective. In general, it always safer to assume that human talent is a consequence of the complicated interaction of genes and the environment, rather that extreme view that it has to be exclusively one or the other. Note, however, that the chart is a representation of mean values. It does not show the variance around the mean. 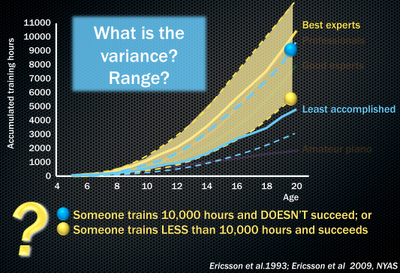 That variance is critical because it would tell us how much of performance is unexplained by the rule.